Objective : The incidence of prostate cancer in Morocco is 12,4 % of male cancers and 5,5 % of all cancers. Our goal is to highlight through a retrospective study the challenges of this cancer in a our context. 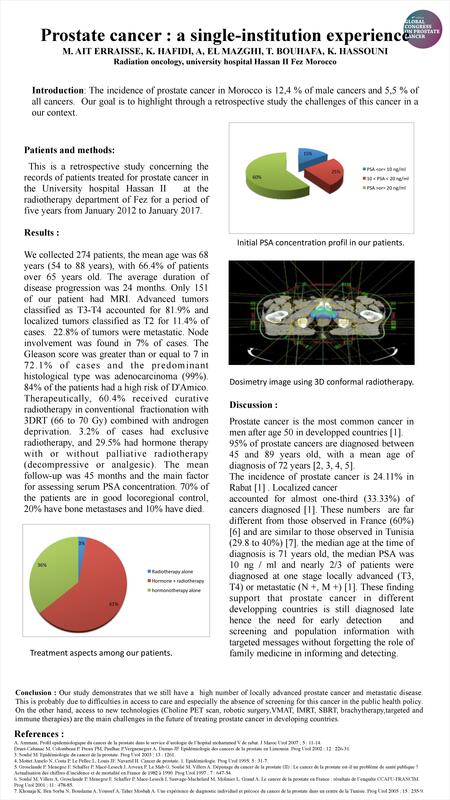 Patients and methods: This is a retrospective study concerning the records of patients treated for prostate cancer in the University hospital Hassan II at the radiotherapy department of Fez for a period of five years from January 2012 to January 2017. Results: We collected 274 patients, the mean age was 68 years (54 to 88 years), with 66.4% of patients over 65 years old. The average duration of disease progression was 24 months. Only 151 of our patient had MRI. Advanced tumors classified as T3-T4 accounted for 81.9% and localized tumors classified as T2 for 11.4% of cases. 22.8% of tumors were metastatic. Node involvement was found in 7% of cases. The Gleason score was greater than or equal to 7 in 72.1% of cases and the predominant histological type was adenocarcinoma (99%). 84% of the patients had a high risk of D'Amico. Therapeutically, 60.4% received curative radiotherapy in conventional fractionation combined with androgen deprivation. 3.2% of cases had exclusive radiotherapy, and 29.5% had hormone therapy with or without palliative radiotherapy (decompressive or analgesic). The mean follow-up was 45 months and the main factor for assessing serum PSA concentration. 70% of the patients are in good locoregional control, 20% have bone metastases and 10% have died. Conclusion: Our series demonstrates that we still have a high number of locally advanced prostate cancer and metastatic disease. This is probably due to difficulties in access to care and especially the absence of screening for this cancer in the public health policy. On the other hand, access to new technologies (Choline PET scan, robotic surgery,VMAT, IMRT, SBRT, brachytherapy,targeted and immune therapies) are the main challenges in the future of treating prostate cancer in developing countries.